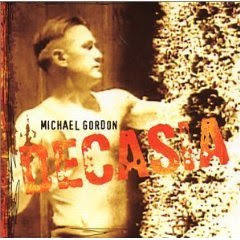 Bill Morrison's Decasia: The State of Decay is probably one of my favorite things ever created, and if you've never seen it you need to rent or buy it immediately, but the visuals wouldn't be nearly as haunting/beautiful if it wasn't for Gordon's score. The detuned instruments and intensity of the orchestral sounds perfectly accompanies the pre-1950 neglected and rotting nitrate-based archival footage. The soundtrack is strong enough to stand on its own however, and it's progressive intensity will definitely test your patience as a listener. If you don't have access to the film, listening to this while closing your eyes and watching the swirling colors on the back of your eyelids could result in an equally hallucinatory experience.